A 7.5 magnitude quake has struck close to New Caledonia in the Pacific, with a tsunami alert issued for coasts within 1,000km (620 miles). Tsunami waves have now been observed, monitors reported. The quake struck at a depth of 10km at 04:18 GMT, with its epicentre 168km east-south-east of Tadine, a town on one of New Caledonia's Loyalty Islands. 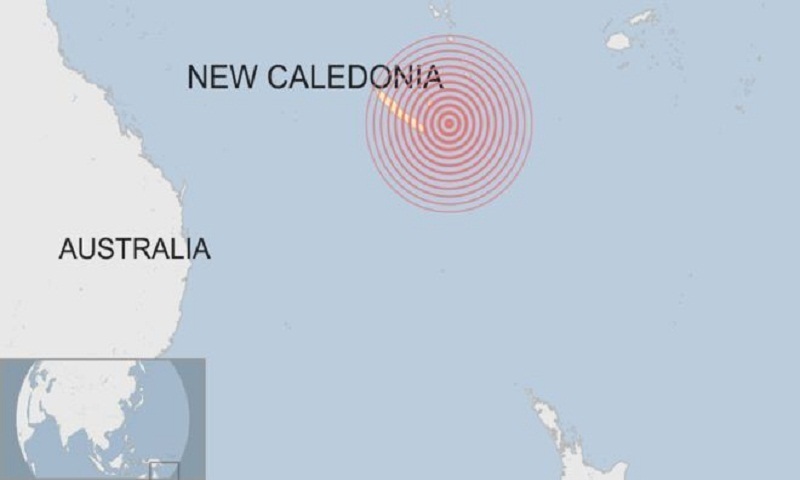 New Caledonia is part of the Pacific's "Ring of Fire", where many earthquakes occur. It a French overseas territory with a population of about 270,000. The Pacific Tsunami Warning Center said that some tsunami waves had been observed and that hazardous waves were forecast for some coasts. It said waves 1m to 3m (3.3ft to 9.8ft) above tide level were possible along the coasts of New Caledonia and Vanuatu, with waves of 0.3m to 1m above tide level for coasts of Fiji. New Zealand's ministry of civil defence and emergency management tweeted that there was no tsunami threat to the nation's coasts. The US Geological Survey (USGS) also recorded a series of aftershocks, two of them at 5.9 magnitude. The Ring of Fire refers to a string of volcanoes, earthquake sites and tectonic plates around the Pacific. It spreads across 40,000km (25,000 miles) from the southern tip of South America all the way to New Zealand. On Saturday, a 7.0 magnitude earthquake struck Alaska, causing people to run from buildings and briefly prompting a tsunami alert for coastal areas. In October, a tsunami struck Palu in Indonesia following a 7.5 magnitude quake, killing more than 1,000 people.